Here’s what happening in Dublin on Thursday October 23rd. Would you like to join us to remember people in Ireland affected by the First World War? 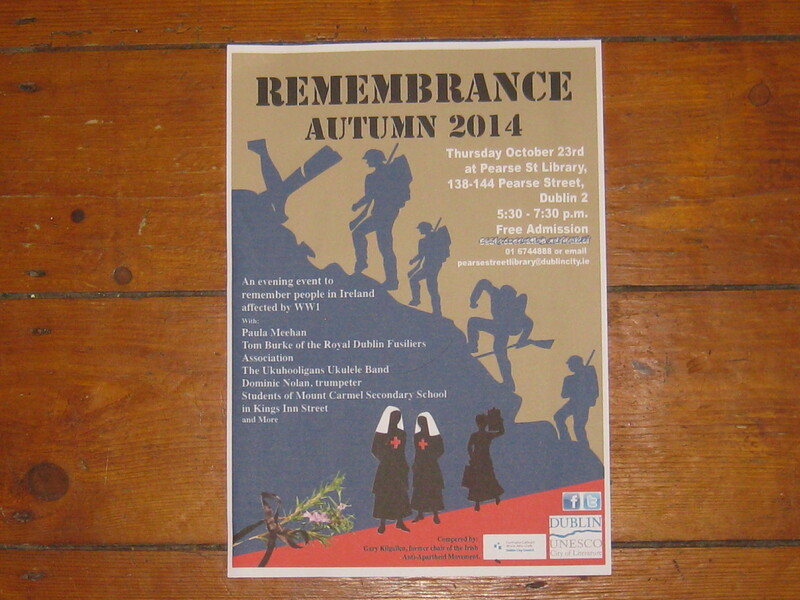 Paula Meehan is reading some of her poems and trumpeter Dominic Nolan will play the Last Post…. Tom Burke will talk about a private in the Royal Dublin Fusiliers, four school students will tell us what they think of war, a ukulele band will play some music of the period and the Ringsend Singers will get us to pack up our troubles…. Dublin’s Pearse Street Library. Thursday October 23rd from 5:30 to 7:30. Are films starring older actors nothing more than a vehicle for displaying jowls and wrinkles in a good light? Do older people want to watch films starring their contemporaries or is age simply a vehicle for older actors gracefully to flaunt their wrinkles? Titian’s The Three Ages of Man does babies, lovers and distant skulls. Nowadays it’s youth, middle age and “Jaysus, you’re lookin’ great,” the last phrase said in ill-concealed surprise. But with 60 the new 50 and with people aged 65-74 designated “young older”, according to the National Council on Ageing, as stage and screen actors age, so the focus shifts from the angst of gilded youth to the serenity of silvered seniors . But while men have Lear, the dilemma for the ageing female actor has always been a shortage of older parts. Now, however, directors are dealing with the subject of age, and this is where Judi Dench, Vanessa Redgrave, Terence Stamp and Derek Jacobi come in. They’re all names you need in order to get older bums on seats. So far we have had the full range of films and television series about ageing: comedy, for example, with The Best Exotic Marigold Hotel and films with music as a unifying theme in Song for Marion and Quartet, directed by Dustin Hoffman (who is now 75). The Man on the Train, a remake by the Irish director Mary McGuckian, offers psychological intrigue, and the BBC promises more frolicsome fun in the second series of Last Tango in Halifax. Finally, there’s Vicious, the upcoming ITV series starring Ian McKellen and Derek Jacobi as a gay couple who have been together for 50 years and, with a friend (Frances de la Tour), have to deal with the arrival of an attractive young man. But age: is that it? Is it enough to portray an obnoxious old geezer in a raincoat (Terence Stamp in Song for Marion), a smiling lecher (Billy Connolly in Quartet) or a character who combines dimples and dementia (Pauline Collins in Quartet)? Is age simply a vehicle for older actors gracefully to flaunt their wrinkles and joke about having to get up to pee five times a night? Dominic Campbell of the Irish organisation Age and Opportunity asks why only white people grow old on screen; people from other cultures may well have stories more interesting than those currently presented to us, he suggests. He has a point. In Song for Marion, Quartet and The Best Exotic Marigold Hotel, the food trolleys and wheelchairs are pushed by black people. Change places, change colour and you have a story, but – and it’s a big but – would it be commercially viable? With more people downloading films or hiring a DVD for a night in, cinemas are finding the competition increasingly difficult. A survey of UK cinemas found that, during the recent icy spell, their audiences dropped by 40 per cent. The receipts for Quartet were down 60 per cent, an indication that older audiences prefer to give treacherous footpaths a miss. But once the funding, the stars and the director come together, it all works – nearly. In Last Tango in Halifax an older couple finally find love and engage in a bit of late-life madness, to the fury of their adult children. But the age thing just isn’t enough, so the episodes are padded out with family rows, a car crash and teenagers on drugs: all things an older viewer may well want to escape. Hoffman, in making Quartet, showed that a film starring older people could well represent an attractive outing for an older audience. As for older people choosing an intelligent storyline, this is where The Man on the Train comes in. Dealing only obliquely with age, it has the sort of quirky ending that leaves people querying what they have just seen, or think they have just seen. There’s no greater test of a movie than the aftershow arguments it provokes. This is certainly true of Terence Stamp and Vanessa Redgrave, who, in Song for Marion, perform their solos in voices that are loud and clear, a tribute to a lifetime of professionalism. But Paul Williams, who directed Song for Marion, doesn’t see it as a film about older people particularly. “There are lots of different films about different sorts of people. Song is about everybody,” he says. Maybe that’s his intention, but the test will be in how the audience – of all ages – sees it. Oh dear no. Having gone grey am I only to watch films like Babette’s Feast and The Whales of August? Absolutely wholly admirable pictures, but only part of the mixed diet I want as an older viewer, and have always wanted as a lover of cinema. And it is not only as an older viewer that I have wantd to avoid family rows, car crashes and teenagers on drugs – these staples of the soap opera and of a certain kind of drama have never appealed. Further, far from searching out elderly actors, one revels in the the beauty of the younger Brad Pitt, Denzel Washington, Jodie Foster or Penelope Cruz. And who wouldn’t love the drama and drive of Erin Brockovich, The Stuntman or The Devil Wears Prada, the power of Training Day – I haven’t seen this in full yet – or The Navigator? What about the suspense and sadness of Cry Freedom? The quiet appeal of The Girl with a Pearl Earring? Blue Velvet: fascinating. Once, I thought I had better find out what the fuss over Apocalypse Now was about – I did not want to watch most of this film but could not stop. I search for films noirs, for black and white British gems, for silent classics or classics from Demy, Antonioni, Bergman. I welcome many more recent films like Bombon el Perro, Souzhou River, Treeless Mountain, Toyko Sonata or Las Acacias. But I have been known to collect disaster movies, and recently enjoyed Unstoppable. I haven’t been to the cinema in a long time and watch my films on a reasonably sized tv screen, finding films to record on dedicated film channels and, to my pleasure, on TG4, which is the only mainstream channel that regularly gives space to films from, for example, Asia and Central and South America. The other channels stick mainly to endless repeats of presumably ‘commercially viable’ Hollywood or British movies which are either of little interest or which one has seen before. I have boundless admiration for Maggie Smith and Dustin Hoffmann, but have also, fortunately, a much wider range of interest than just actors of their vintage: imaginative film-making involves themes of all kinds and actors of all ages.